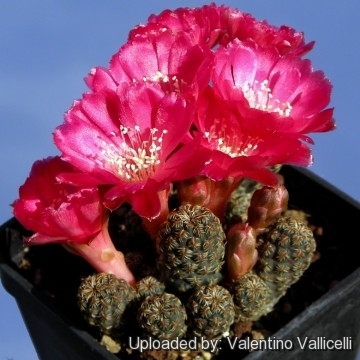 Sulcorebutia taratensis var. minima Photo by: Andrea B. This is a freely clustering miniature plant that soon forms nice groups. 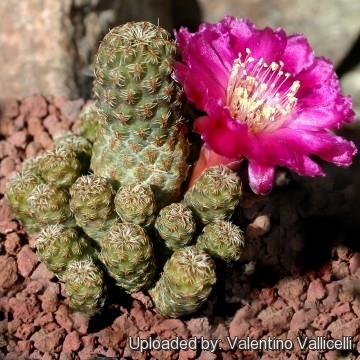 Description: Sulcorebutia taratensis var. 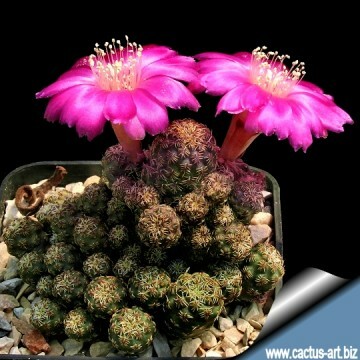 minima is one of the innumerable local form of the very variable Rebutia steinbachii (= Sulcorebutia steinbachii). 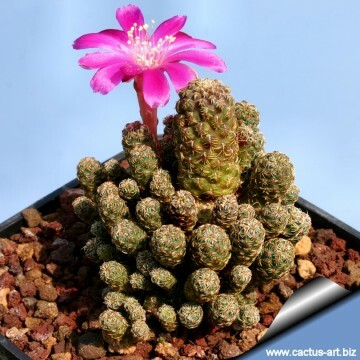 It distinguishes from standard taratensis for its thinner bodies (less than 2 cm in width) which cluster like a mad, readily forming crowded mounds or cushions with hundred of heads. 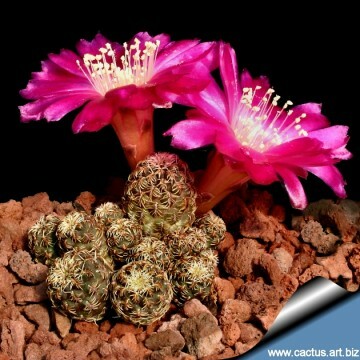 The flowers are bright purple and the spination of well-grown specimens is pleasing. 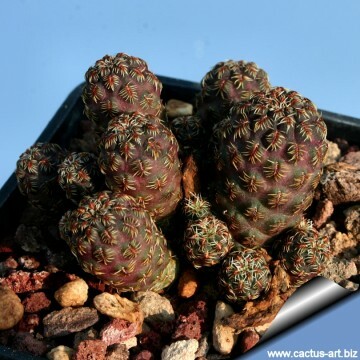 It is one of the tiniest Sulcorebutia. 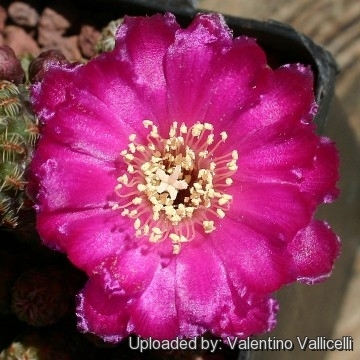 Note: Rebutia taratensis var. minima is apparently a neotenic variety of the species in which juvenile spination is retained throughout the life of the plant, while many of the other varieties are dimorphic (short spined juvenile forms transform at maturity to strongly spined forms). Habit: It is a clumping plant growing readily forming, especially in cultivation, clumps of h heads from the base. Roots: More or less thickened and carrot-like. Stem: Single heads minuscule 5–20 mm wide, and 25-50 mm tall, globular, to clavate somehow apically depressed, very dark tanned green to dark magenta-green sometime tinged red, not completely hidden under the covering of spines. Ribs: Few, spiralling, poorly distinguished, forming oblong rhomboid tubercles with well-defined grooves. Areoles: Narrow 1-3 mm long, 0,5 mm large almost naked, depressed with short grey or brown felt. Radial spines: (6-)8-12(-14) about up to 3 mm long, acicular, adpressed against the body, thin, pectinate pointing sidewards and downwards less than 5 mm in length. Creamy-white, with darker brown base. These spines don't obscure the stem but form a nice spiralling pattern. Flowers: Numerous at the base of the plant, typically dark purple, with a silky sheen. Floral tube funnel-shaped, with broad naked scales. Blooming season: Spring (April - May) and remain open for up to five days. Fruits: Small papery olive green to reddish brown at maturity. 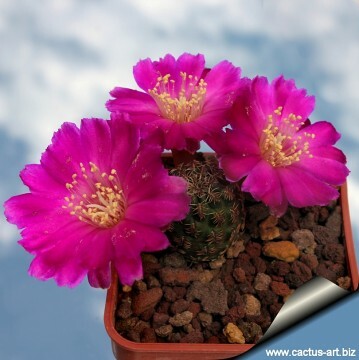 Notes: This plant is now considered by most authors a synonym of Sulcorebutia steinbachii but there is some confusion and others says that it is a smallish variant of Sulcorebutia rauschii with uniformly coloured flowers and fewer dark pectinated spines. Cultivation and Propagation: Very difficult to find high quality plants of this species in cultivation, S. taratensis "minima" loves a very permeable, coarse mineral soil as well as to be strictly kept dry throughout the winter quiescent period since it is very sensitive to any moisture excesses, To prevent rottenness it is also advisable to surround its root neck by very rough sand or grit, this help a fast water drainage and an appropriate air circulation. For its sensitive roots this species is frequently grafted to avoid root problems. Plants are quite frost hardy -5 (-10)° C. Water moderately in the growing season, keep dry during the winter rest. 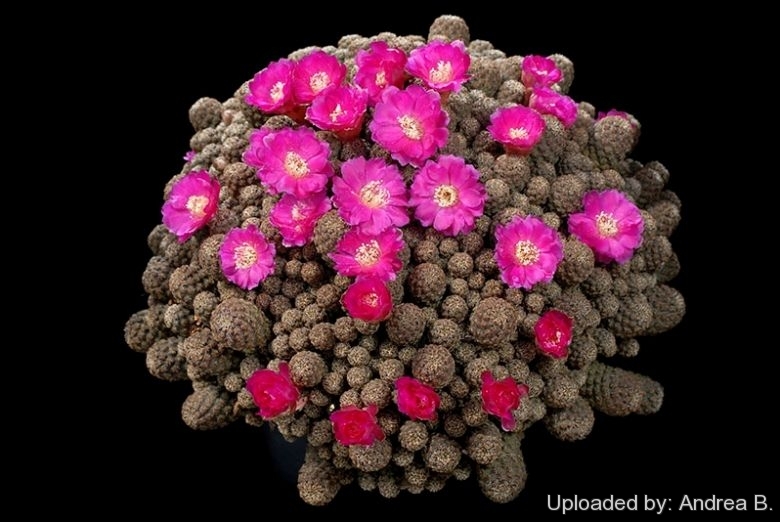 Overwinter in a cool place (at 0/10°C) this is important for the flowers as well as for plants health. Without this cool winter period they normally wont get any buds.